Often a quiet night at home with a good movie is just what's needed at the end of a long week. It's not that I'm planning on staying in. Quiet the contrary, there's something to hoot about happening at my kids' Catholic school tonight. But afterward, when the little ones have turned in, there are several great suggestions for a Friday night movie that get the mark of approval in a year-by-year top ten list. WASHINGTON (CNS) -- To ensure that the hymns used at Mass are "doctrinally correct" and based on Scripture and liturgical texts, the U.S. bishops will debate and vote on a new directory for music and the liturgy at their Nov. 13-16 meeting in Baltimore. While I have occasionally found music that raised my doctrinal eyebrows--though at least they are not the really bushy ones--I have maintained that music, like any other form of evangelization, needs to meet people where they are. So I've reserved judgment concerning music that really isn't to my taste. Actually, I personally take an eclectic approach to music. Sometimes I prefer listening to music that reminds me of my youth, and at other times I'm all for going with the tradition. Whatever the bishops decide I am convinced that their decisions will have the pastoral needs of the Church in mind--in terms of worship, doctrine, and--never to forget--evangelization. Nothing speaks to the soul hungry for God like song. Indeed, music is a great healer. Perhaps this is true because it is God who inspires music in the soul. We need not look farther than the Psalms to see it. I fondly remember my conversations with my mother when I was a child regarding the Psalms. "The Psalms were meant to be sung," she would tell me. I've held on to that truth all my life, perhaps I should say that I've sung it, although off key, all my life. In all, we have the opportunity to pray for the bishops as they prepare to meet, and rather than taking a critical stance, let us show our catholicity by trusting that the Spirit truly guides those who have been entrusted with our souls. In many ways the gospel passage above might well be applied to keeping oneself busy with the things of the Lord. Certainly, we can extrapolate and apply the scripture to our daily lives, though the main message for us is about being vigilant. Often it is easy to become so busy with the things that drive our days that we run the risk of losing sight of what is most important. There comes a point when we have to say, “This is enough.” I believe we serve God in an important way when we take time to serve our families and loved ones. Thus, I’m keeping my post short today—honestly I ran way overtime with work that I brought home from work (surely you must know that teachers have homework too). I figure an hour is about enough—that is for me; for the kids at school it ought to be much less. I shouldn't try to keep up with the 12 hour workday crowd. There are greater needs to attend! One of the best things that any of us can do for ourselves is to enjoy the time we have with those whom we love most. Undoubtedly, we can infuse those moments with the presence of God by taking just a small amount of time each day to center our lives in God, and by doing so we place our hearts in a constant state of prayer, and in this way we remain vigilant for the Master’s return. If I ever felt that there was something to worry about or to be concerned ultimately in life, today’s readings do a lot to put my fears to rest. God lets us know that his grace is working in our lives and that through it we will be abundantly blessed. The gospel tells us to be rich in what matters to God. Thus, we are to be rich in spirit; that is, we are to be rich in our prayer life; rich in communication with God, but also rich in our relationships with others. We are to be rich in our sense of community and rich in a holy attitude that seeks for the good of others. We are to seek relationships of love and friendship—with our spouses and children, and with all whom we have contact daily. Too often it’s easy to find a common attitude similar to what we see in the gospel where the greedy store up for themselves and rest securely. Too of often the poor and suffering of our world get overlooked, or we rationalize their situations to satisfy our attitude that it has nothing to do with us and that anyone who suffers in this life has only himself or herself to blame. Sometimes the degree to which it’s possible to find a self-justifying attitude is appalling. One feature I’ve noticed among the Catholic bloggers who tend to take up neo-conservative political positions is that regardless of what is being discussed, they always claim to be right and there is no sense in trying to make a point to the contrary. They remind me of the very people who put Jesus to death. They claim to love their faith and religion but their hearts are far from God. I have to wonder where these folks are really coming from. I find an alarming trend exists among many of the popular Catholic bloggers to dissent with the US bishops and frequently to ridicule the USCCB on just about everything. I find it appalling when I see them ridiculing parishes and communities that strive toward healing and unity. Woe to me if I find myself in a similar position where I feel secure enough to trust in my ways over the ways of God—be it with anything that this life offers. We cannot put our trust in political ideologies, in wealth, or in the might of nations. Our role is to trust in something else, even perhaps to trust in something that runs contrary to this world’s wisdom. The gift of grace has saved us, and certainly we are blind if we do not see and understand mercy as grace. Now our job is to share a little grace—to share the mercy we have received. In sharing mercy and grace, in reaching out and offering a day of amnesty, we will be making ourselves rich in the things of God. This week, as many of us begin our workweeks, let us be thankful for the wonderful opportunities that our Lord has given us to share the wealth of his grace in our encounter with those whom we will meet and serve. Let us pray together for our Church, and let us particularly be strong in the things that matter most. Our Lord has fed us with his own Body, may we carry the grace we hold within us to all the world. During Confirmation interviews I like to explain certain aspects of the sacrament that the confirmands may not have yet considered. Often young people may not realize that in Confirmation they will receive the fullness of God’s Spirit. Honestly, from a theological point of view we tend to find less written on the Holy Spirit—maybe it’s a sign of the Spirit’s mysterious work in our lives. Understanding the Spirit requires the effort of uncovering its presence in our life experience. As I was looking at the readings for today I noticed right away the reference in Ephesians to the Holy Spirit. It tells us that we were sealed with the promised Holy Spirit as first installment of our inheritance toward redemption. In other words, what we receive as believers in the power of Christ is the beginning of heaven. It’s the true blessing above all other blessings, and it’s a foreshadowing of a blessing much greater to come—the blessing of eternal life. In the idea of blessing we possess the key to a deeper understanding of what this Friday’s readings are all about. God wants us to know that we are chosen and that we will never be abandoned. His love is a love that reaches beyond life and death to something that we have not yet imagined. Being confirmed in the Church and receiving the fullness of the Spirit is like a doorway to an unimaginable degree of blessing that is real in a way that makes the realities of this life appear to be insignificant in comparison. God’s mysterious ways are confirmed to us daily. I’ve learned that we have to be keenly aware in order to detect God’s presence. If you’re serious about it, and if you pray about it, God will heighten your awareness; you’ll begin to see God in every situation. I really do believe this. Regardless of how mundane something may appear to be, God is present. Regardless of how difficult or impossible a situation may seem, God’s presence is never too far away. What we’ve got to do is to trust in the blessing. You may have waited many years for something and perhaps you have all but given up; nevertheless, your patience will not go unrewarded. You will receive your blessing—just keep having faith. After all, God know knows you well. You were chosen and that in itself is cause for great rejoicing. It just happens to be the fact that we do always receive the Spirit’s blessing, though sometimes many years pass before we uncover it. Yesterday I had the privilege of being able to spend about an hour answering questions for a group of young men working toward their Ad Altare Dei Boy Scout award. I hope that some of them visit the blog today and perhaps join us with even more questions. It seems that an hour is too short a time to get all your questions answered. The topic of the discussion was Holy Orders, and I was on the “seat of heat.” My job was to answer any questions about being a deacon that anyone could come up with. Well, here’s your chance to do that again—only this time in the combox. Actually, the questions were prepared and I knew what to expect, but I really wanted it to be open to anything that anyone wanted to know. Surprisingly in a recent Confirmation interview when I asked, "Do you have any questions?" I got a "What made you decide to become a deacon?" It was really a pleasure to visit with the Scouts of my parish. I remember when I was their age and even younger how important the adult men in my life were to me. I especially remember my uncles and distant cousins. I will never forget the look of joy in their eyes when they had the opportunity to spend time with young people. There were some genuinely good individuals in my life as a boy, and I am thankful for them. So, I jump at the opportunity to pass it along when I get the chance. Also, I commend the Scout leaders who were there yesterday. I sometimes wonder how you guys manage to do all you do. Being a scout leader is a tough job. Today’s reading from the letter of Paul to the Galatians teaches us that Christ has set us free. 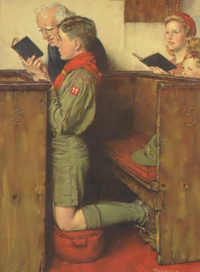 It is a joy for me as a deacon to offer instruction for the Ad Altare Dei medal, and it is a real privilege to have such a program available to teach Scouts the value of knowing Christ in his power, for it is the power of our Lord that sets us free to be everything and anything we can dream possible.